Public alpha demo is ready to play! Space Nomads, the cooperative defense from Loading Studios, has recently launched a crowdfunding drive on Indiegogo. The team is looking for a push to finish out some of the more elaborate features in the works, including fleshing out the explorable terrain, creating flying vehicles, designing a PvP mode, and adding underground areas and ocean biomes. Even more exciting is the alpha demo is available to download! We spent some time with the alpha demo of Space Nomads and really liked what we saw. 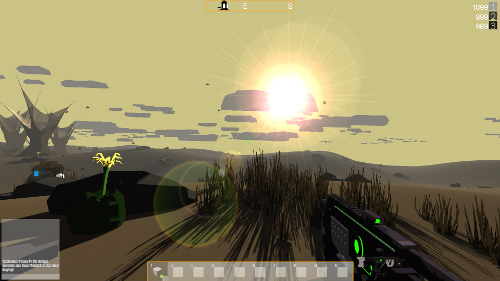 The game has a very desolate but dangerous feel to it, with just you and your team stranded in the desert with only the sunlight keeping you safe. Gather resources as quickly as you can during the day, then build up a defensive wall block by block to surround and protect the podcell. Turrets don't come cheap, and you'll need to really hustle to rake in the resources you need to survive the night. The enemies implemented in the alpha version are simple but pretty rugged. They broke through our meager block fort within a handful of waves, leaving us little choice but to shoot them in their stupid alien bug faces with our own weapons. Jerks trying to destroy our podcell... Space Nomads was obviously designed for co-op play. It's possible to go it solo, but working as a team is both more effective and more entertaining. 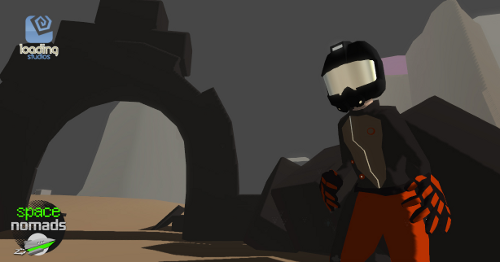 The alpha demo for Space Nomads is currently available for Windows, Mac and Linux. It supports eight player online co-op, but Loading Studios is testing higher numbers for the final release. The IndieGoGo funding drive ends July 27th. Page created in 1.8744 seconds.